Raith Rovers will take a one-goal lead to Easter Road on Saturday after a lion-hearted display in the play-off quarter-final first leg at Stark’s Park tonight. In a performance packed with grit and determination, Rovers put their bodies on the line time and again to keep Hibs at bay before sub Harry Panayiotou struck with 15 minutes left. It was substance over style as Raith did the ugly side of the game, and did it well, to thwart the Edinburgh side and extend their superb unbeaten run to 12 games. Raith boss Ray McKinnon set his team out to frustate the opposition and ensure his side were still in the tie at the halfway stage - and the plan worked perfectly. “Hibs gave us a very tough game but all credit to my lads - they are in good form, they are a very strong bunch and they wouldn’t lie down tonight,” he said. “We wanted to take something into the second leg and we’ve done that. A draw would have been a fine result for us, but Hibs will have to open up on Saturday which might leave them a bit vulnerable. Any thoughts that Raith’s form going into the play-offs would make Hibs any less formidable opponents were quickly dispelled in a tough opening 45 minutes. Indeed, McKinnon would have been delighted to get his side into half-time with the game still goalless after enduring a tense first half dominated by the Edinburgh club. While Raith competed well they were passed off the park by Hibs at times and but for Kevin Cuthbert, some determined defending, and another Stark’s Park sitter from Jason Cummings, they might have been a goal or two down. McKinnon made just one change from the side that defeated Livingston in the final league game on Saturday, bringing Kyle Benedictus back from suspension with Louis Longridge dropping to the bench. 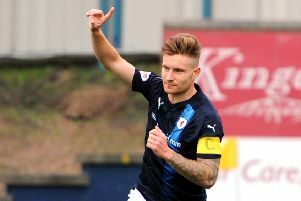 It meant a return to midfield for Iain Davidson as Raith lined up with the same 4-2-3-1 formation that delivered a 2-1 victory over Hibs on their last visit to Stark’s Park on March 19. Hibs, on the other hand, went with a change of tactics, switching to three at the back. The game started at a frenetic pace and Hibs fashioned the first chance on six minutes when a slip from Rory McKeown allowed Jason Cummings to break. Although Craig Barr made an excellent recovery tackle, Cummings managed to keep the ball in play, before forcing a save from Cuthbert at his near post at the expense of a fruitless corner. The visitors pushed forward again on 11 minutes when Lewis Stevenson cut in from the left and teed up Marvin Bartley at the edge of the D but the midfielder’s well struck effort was straight at Cuthbert, who gathered at the second attempt. While Hibs had the upper hand it was not completely one-sided and Raith announced themselves as an attacking force on 18 minutes when McKeown’s deep cross was knocked down by Ross Callachan to James Craigen who fizzed an effort narrowly past the upright. Back came Alan Stubbs’ side and Cuthbert had to show safe hands while diving to save Stokes’ close range header from Gray’s cross. Desperate defending from Raith was required on 33 minutes as a free-kick to the feet of Cummings in the box but Lewis Toshney managed to block the striker’s effort before Liam Fontaine knocked the rebound over. As the pressure built, Raith’s defence started to show signs of creaking and the back door finally opened for Cummings on 39 minutes. McGinn’s clipped pass broke the Raith offside trap to leave Cummings with just Cuthbert to beat, but luckily for the hosts, the striker blew his chance, lobbing the ball over the stranded ‘keeper, and over the bar, to the delight of the South Stand. There was still time for another decent Hibs chance before the break as Stokes made space for himself on the edge of the area before forcing Cuthbert into another fine save with a powerful low drive. The second half followed a similar pattern to the first with Hibs dominating the ball, but their attacking threat waned somewhat, and Rovers took heart. McKinnon made a double change on 64 minutes, introducing Panayiotou and Longridge from the bench, helping provide support for Ryan Hardie, who up until then had been a castaway up front on his own. A roar went up when Raith won a corner in the 74th minute, and the noise levels exploded seconds later when Longridge delivered to the near post, and Panayiotou headed home. The goal and celebrations will have helped make up for the 21-year-old Leicester City loanee missing out on the Endligh Premiership title party this week. Raith had grabbed the lead with their first effort on target, and they almost made it 2-0 three minutes later when Longridge forced his way into the box and his shot produced a fine reflex save from Conrad Logan. Hibs were rattled and they never recovered their composure. A few wild efforts from distance, and a soft penalty appeal for the slightest shove on Stokes, were all they could muster in the closing stages as Raith held on to victory. Alan Stubbs’ post-match moans over the condition of the pitch, penalty kicks turned down and missed chances sounded like a man clutching at straws and making excuses. Raith are 12 games unbeaten for a reason after all. Make it 13 and they are in the semi-final. It’s only half-time in the tie, but Rovers have given themselves a great chance. Raith Rovers: Cuthbert, Thomson, Callachan, Toshney, Benedictus, Davidson, Hardie (Stewart 90), Connolly (Longridge 64), McKeown, Craigen (Panayiotou 64), Barr. Not used: Law, Anderson, Bates, Robertson. Hibernian: Logan, Gray, Hanlon, Fontaine (Henderson 84), Bartley, Fyvie (McGeough 80), Stevenson, McGinn, McGregor, Stokes, Cummings (Keatings 80). Not used: Oxley, Boyle, Gunnarsson, Dagnall.